FERC Expands Permissible Communications Between Interstate Gas Pipelines and Electric Transmission Operators November 15 – FERC issued Order No. 787, a final rule permitting interstate natural gas pipelines and electric transmission operators to voluntarily share non-public, operational information with each other to promote reliable service or operational planning. In the rule, FERC indicated that it was permitting the communication of a broad range of non-public, operational information to provide flexibility to individual transporters to share information they deem necessary to promote reliable service on their system. To protect against undue discrimination and ensure the information’s confidentiality, FERC also adopted a No-Conduit Rule prohibiting recipients of this information from disclosing it to affiliates or third parties. The rule follows FERC’s series of technical conferences and requests for comments addressing increasing interdependence between the natural gas and electric industries. Geomagnetic Disturbance Operations November 14 – NERC submitted a petition for approval of proposed reliability standard EOP-010-1, which addresses geomagnetic disturbance operations. 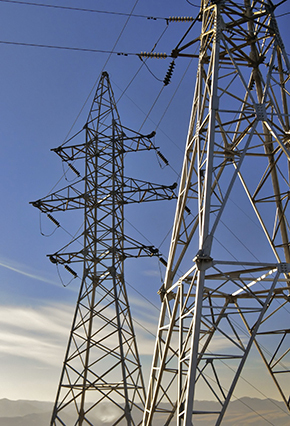 The proposed reliability standard was submitted in response to FERC Order No. 779 and seeks to mitigate the effects of geomagnetic disturbances by implementing operating plans, processes, and procedures. FERC Rules on Transmission Relay Loadability November 13 – FERC accepted NERC’s February 2013 compliance filing required by Orders No. 733 and 759, identifying criteria for sub-200 kV circuits that are required to set load-responsive phase protection relays and are critical to the bulk power system. NERC’s filing included a summary of the base cases for six criteria, a discussion of the studies that planning coordinators can use to identify critical circuits, an assessment of the standard’s comprehensiveness, and an evaluation of specific loadability and power factor angles. NERC Compliance Filing on Performance Audit Settlement November 14 – NERC submitted acompliance filing in response to FERC’s January 16 Order approving a Settlement Agreement, which related to the FERC Office of Enforcement’s findings and recommendations arising out of its 2012 performance audit of NERC. The compliance filing contains NERC’s budget-to-actual variance information for the third quarter of 2013, as is required by FERC’s January 16 Order. NERC/CAISO Report on Reliability and the Integration of Renewable Generation November 13 – NERC and the California ISO (CAISO) jointly issued a report entitled “Maintaining Bulk-Power System Reliability While Integrating Variable Energy Resources – CAISO Approach.” The report describes changes to system planning and operations that the CAISO is pursuing to ensure continued electric reliability as it prepares to integrate 11,000 MW of variable renewable generation onto the grid by 2020. The report concludes that these impacts can be reduced by employing a mix of market approaches, technology improvements, and reliability or other rule changes. 2014-2016 NERC Reliability Standards Development Plan November 8 – NERC submitted its 2014-2016 Reliability Standards Development Plan. In doing so, NERC is informing FERC and other stakeholders of the changes to the content of the 2013-2015 Reliability Standards Development Plan, as well as updates timelines for projects included in prior development plans. NERC Quarterly Meeting News November 7 – At its quarterly Board of Trustees meeting, NERC adopted its 2014-2016 Standards Development Plan. Additionally, the Board passed a resolution on operating communication protocol standards development (COM 002 and 003) and adopted standards on geomagnetic disturbance mitigation (EOP-010-1), protection system maintenance and testing (PRC-005-03), and transmission relay loadability (PRC-023-03). Finally, the Board adopted two interpretations of CIP standards, accepted the NERC-CAISO report on renewable integration, and adopted the withdrawal of SPP’s regional standard on underfrequency load shedding. The next meeting of the Board of Trustees will be on February 6. GridEx II Completed November 14 – NERC and industry participants organized and completed a two-day exercise in cyber and physical security throughout the energy industry. GridEx II allowed over 200 industry and government organizations to assess their plans and capabilities for potential crisis scenarios. The exercise simulated a wide range of potential problems, including computer viruses, denial of service attacks, and bombings of critical infrastructure. WECC Announces Peak Reliability Website Launch Date November 8 – WECC announced that the website for Peak Reliability, www.peakrc.com, is slated to go live on January 1, 2014. The current security portal, www.weccrc.org, will remain active. Reid, Senate Chairmen Call for Greater Protection of Power Infrastructure, Call for Meeting to Discuss Enhanced Security November 12 – Senate Majority Leader Harry Reid, the Senate Chairmen of the Intelligence, Homeland Security, Energy and Natural Resources, and the Chairman of the Senate Energy Committee’s Subcommittee on Energy sent a letter to the heads of the Edison Electric Institute, National Rural Electric Cooperative Association, and American Public Power Association requesting that the electric industry “take immediate and substantial steps to better protect and defend infrastructure critical to power delivery.” The request comes in the wake of an incident in which vandals damaged several transformers at a Pacific Gas & Electric Co. substation in California. The letter also requests that the associations “identify electric utility executives” to meet with the Senators on the industry’s behalf to discuss reliability and infrastructure protection measures that are being developed in consultation with the federal government.